"I rehearsed my work only at night, and when I rehearsed, I stepped into another space that was not the same as my everyday space. You could almost call it a séance." 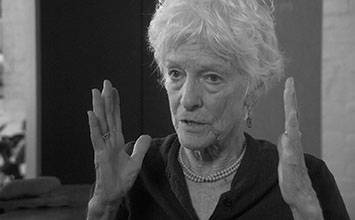 Joan Jonas's practice is one full of the synergy, dynamism, and constant flux that is present in life itself. There is nothing static or easily definable about this art. Jonas works as a Performance artist, but within this realm she incorporates drawing, dance, noise, video, travel, and at the same time introduces various sculptural objects, photographs, and props. She also interweaves a plethora of literary sources, including poems, myths, and fairytales, and as such, presents a highly complex and multi-layered private imaginative world to a public audience. The result is not usually simple, and often viewers feel overwhelmed, as though they cannot grasp any sense of linear narrative in the artist's work. This is the honesty and integrity of a Jonas piece; she exposes without restraint that the self is fragmentary, anxious, and ultimately nonsensical. Since the early 1960s, and still today, albeit now with more institutional support, Jonas continues to examine her own identity, often in relation to other artists, cultural rituals, gender equality, societal gaze, and contemporary politics. Jonas is not afraid to let pieces take on a life of their own. Jonas's performances are more like paintings in this way; they start and then evolve intuitively. It is a major achievement to be able to make art without imposing limitations. Most performances by others are more tightly planned and wholly envisioned before they begin. Jonas is interested in the relationship between humans and animals. She suggests that to live spiritually is to live alongside creatures, and for Jonas, this is usually a dog. In art history, interestingly, a dog is curled up by the feet of the figure of Melancolia (1514)in Albrecht Dürer's famous engraving, presenting the dog a suitable companion for the curious and reflective mind. Kiki Smith visits the same themes, and Joseph Beuys, when locked in a room with a coyote, positioned himself a shaman, acknowledging the same sense of "magical intrusion" that Jonas's speaks of when in the company of animals. Jonas brings movement to static Surrealist works, for example, Jonas's My New Theater pieces, in which videos are displayed in wooden boxes with props inside recall the creations of Joseph Cornell. Her whole career echoes the important Surrealist question, Who Am I, and the recurrence of the mirror reasserts this idea. Her use of funnels, trumpets, and spheres are motifs also found in the canvases of Remedios Varo, and all such parallels remind the viewer that Jonas too is interested in mixing the conscious and unconscious together. Like the Surrealists, she is an artist working to celebrate the imagination, to unite disparate elements, and to dissolve boundaries. Today, Jonas re-visits old performances and restages these in new locations, with new props, and with new performers. As such she successfully communicates that everything evolves and changes, and that in fact, to freeze anything in time can only be something of an illusion. She reveals that although traditional art may bring peace and space for reflection, it only serves to provide contrast to the chaos and endless shift in life, whilst her work, by contrast, holds a mirror up to this. 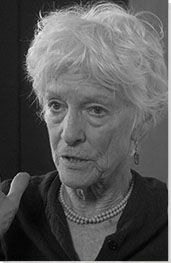 Joan Amerman Edwards was born in New York in 1936. Her parents divorced when she was young, and she spent most of her childhood living between Manhattan and Long Island. Jonas has said that she knew that she wanted to become an artist from around age six and that this ambition was highly encouraged by her surrounding artistic family, especially by her father who was an aspiring writer. Her mother was an avid collector of curiosities and often took the young Jonas to art galleries and to the opera. Jonas's aunt was a painter, and her stepfather a jazz musician and a magician. In Mirror Piece I, Jonas along with other female performers employs mirrors as props in which they slowly perform a series of choreographed movements in front of a live audience. The work immediately recalls the work of fellow artists Ana Mendieta and Francesca Woodman, but while these two artists performed only for their camera, the audience is crucial for Jonas. Indeed, in the Jonas version of this way of assessing identity, the mirrors reflect not only the bodies of the performers, but also, and just as importantly, the audience members themselves. Indeed, by using very large mirrors that could easily break if not handled correctly, Jonas sought to create an unsettling feeling. When asked about the use of the mirror in her work, Jonas has commented that she "was interested in how an audience might feel uneasy as they were caught looking at themselves in the performance. In a way, narcissism is the nature of the medium." This interest in narcissism, in the fabric of selfhood, remains an equally crucial focus today as it was in 1969. The work was re-staged in 2018 at the Tate Modern exhibition, and Jonas has said of such re-envisioning that she continues to find new layers and meaning in her work. As part of a larger series of other Mirror Pieces, this family of works is used as a tool to confront viewers on the subject of voyeuristic social standards placed upon women in western society. Jonas's performance-based practice was revolutionized and invigorated in 1970 when - while visiting Japan - she bought her first hand-held video camera. Upon returning home she started to play and experiment with the capabilities and limits of this new portable technology. Using the camera, a TV screen, and a live video feed, she created her first video performance: Organic Honey's Video Telepathy. In this performance, Jonas performs as herself, as well as a masked alter ego double, Organic Honey. Much like a character from a Claude Cahun performance or a Cindy Sherman film still, Honey, dressed in a costume and doll mask, stood for the artists' questioning of fixed identity, narcissism, and womanhood. Mirrors and reflected mirrored images were used on a technical level for spatial layering, as well as on the level of meaning to separate Jonas from Honey, and paradoxically to unite the two together. By using props including robes, fans, and headdresses, a curator at the Dia Art Foundation suggests that Jonas "foregrounds emblems of female identity." This work marks a cornerstone for Jonas in a long lineage of performances that discuss and question women's issues, body image, and societal demands placed on the female. She comments that this questioning, and indeed the work itself, came about at a time when she was an active part of a women's group; "It had a big effect on my life. The whole [women's liberation] movement did. Our group was small. We had a lot of pent-up anger about the whole situation. [We went in for] self-examination, and for revealing intimate aspects of one's sensibilities. Organic Honey's Visual Telepathy was all about asking the question: what is the feminine? I was concerned with the roles women play". Furthermore, it is interesting that the words "organic" and "telepathy" creep into the title of this work. By using the word "organic" Jonas reveals her love of the earth and desire to nurture and protect its gifts. And by introducing "telepathy", she infers that there is some sort of spiritual and magical faculties at work in her examination of self. The Juniper Tree installation was first created in 1976, and has since been recreated in both 1994 and 2018. The work explores Jonas's love of folklore and of fairy tales. The work is her reinterpretation of the tale of the same name taken from the first volume of the Brothers Grimm fairy tales. The story begins with a woman wishing for a child "as red as blood and as white as snow", while standing by the juniper tree where she would eventually be buried. After giving birth to a boy, she dies and her husband re-marries and has a daughter. The step-mother, jealous of the step-son, kills him and serves his remains to his father in a stew. The son is then reincarnated into a bird and gets his revenge on his stop-mother by crushing her with a millstone. Upon the stepmother's death, the son is reborn and reunited with his father and half-sister. This work became an important transitional work for Jonas, in that she uses paint, the practice of drawing, as well as narrative and text to represent the symbols and motifs in the story. In the process of performing the work, she would make ritualistic and totem-like paintings, working on an installation stage-set filled with props and music. The documentation of this installation would then be added to following recreations, including sound, all serving to further layer and add to the rich narrative, symbolism, and imagery. Indeed, Jonas is particularly interested in how fairy tales change slightly as they are passed from one generation to the next. She is also interested in the extreme casting of the "good" or "evil" woman. In her performance, Jonas takes on multiple roles, that of the wise woman, the storyteller, and the evil woman, asserting to an audience that life is not easy to define, and human actions not easy to predict. Artist Kiki Smith shares a similar passion for fairytales and often re-envisions the classic: Little Red Riding Hood. Jonas's performative practice developed organically and led her to consider how to make performance works that could still operate while she herself was not present. My New Theatre 1: Tap Dancing presents a film of the feet of a tap and ballet dancer moving through different choreography. The film is shown on a small screen, or projected, at the back of a long wooden rectangular structure, which stands on two sets of wooden legs. The structure is entirely plain on the outside, but inside, as well as the film playing, there is a miniature set placed before the moving image; the set is composed of objects that is some way bare resemblance to the happening on the film. Visually, the works take viewers directly back to iconic artworks made by the Surrealists. The collection of delicately placed curiosities recalls the intimate and magical boxes of Joseph Cornell, and the overall placement of disparate objects side by side, as well as playing with notions of scale, reminds one strongly of the dreamlike visions of Renée Magritte. In discussion with art critic Robert Ayers, Jonas comments that her theatre boxes are "an extension of the studio. It's as though you are looking into a miniature world. That's the indoor space, and then I also include landscape space". Over time, the artist has built eight of these structures each with its own custom made video and internal small stage set, the latter including objects which mimic props used in Jonas's live performances. This notion of how performance art can exist without the performer is a constant theme at the core of the theatre box works. The new medium challenges the notion of what performance is. In an interview with the Tate, Jonas comments that she felt drawn to video so that her performance work would not simply "disappear" after its execution. Jonas's use of objects, and film, set the groundwork for new methods of documenting performance that would go on to change the medium. It was no longer only photographs that provided evidence of the act and of performative work, but now multi-layered fragments of documentation could be made available. This is not the case for earlier versions of work by the artist, including Mirror Piece I, which can now only be studied through remaining photographs. Reanimation brings together many of the elements of multi-layered materials and meanings which Jonas has explored throughout her practice. Jonas comments that her interest in layers stems from "the way our brains function. We think of several things at the same time. We see things and think another, we see one picture and there's another picture on top of it. I think in a way my work represents that way of seeing the world - putting things together in order to say something." In this spirit, holding up a mirror to our multi-faceted brain, Reanimation is composed of four video screens that show snowy mountain peaks and other views of Nordic landscape. The screens are situated in a fabricated 'house', in which there are also two benches, a frame with handing mirrored balls, two wooden theatre boxes, fifteen ink drawings, two paintings, a soundtrack, and a voice recording using excerpts from Norwegian novels. Then, as if that was not enough to absorb, Jonas herself performs in the space, wearing masks, robes, and using various props. Ice cubes melt as the artist moves rhythmically around the room wafting sheets of fabric to catch and reflect the light of the mirrored balls. The artist's experiences whilst travelling in Iceland and Norway have inspired many of the elements of this piece. Travelling has always been a major part of Jonas's practice, with the inclusion of other cultural dance and theatre traditions appearing both in very early works, and in pieces being made today. The artist has lived and worked in many different countries and endeavors to learn from all people. This particular work originally started as a performative demonstration, which was then reworked and added to over a three-year period, becoming equally poetic, as it is political. The piece pays close attention to landscape and to the environment through the lens of human interaction. It celebrates the beauty of glaciers and of nature, but at the same time mournfully highlights that these glaciers are now melting and that disaster will ensue if human beings to not do better. In fitting line with the Northern European chill and aesthetic, the work well deserves the bombastic title of a Gesamtkunstwerk. Stream or River, Flight or Pattern documents how travel simultaneously functions as a form of research and as a source of inspiration for Jonas. The work features a series of three films showing a montage of diverse settings including Japan, Greece, Morocco, India, Germany, the Netherlands, Norway, Poland, Hungary, and Ireland. The videos reveal snapshots of locations filmed on the move, as well as scenes of Jonas painting with long brushes through the reflection of a mirror. She comments in an interview with the Tate that she "is very inspired by travel, by seeing new things and new places. In Stream or River, Flight or Pattern, I travelled quite a bit during the year that I was making that. In all the places I had my camera, and I would record things that interested me. Not just anything, but I was interested in birds for instance, and trees and rituals, that are in the video. That's how I stay inspired." This work uses the elaborate language built over the years of a long career, using mirrors and reflections, drawing without looking (paying homage to the Surrealist technique of automatism), assessing the very nature of performance itself and in turn how to document such, and all the while staying focused on the pinnacle importance of one's surrounding environment. Jonas explores different cultures, embraces ritual, and adds fairy tales to her travelling performance. Her paintings are made within the work while utterly immersed in nature, for example travelling to bird sanctuaries and redwood forests to find idyllic locations. Two curators who worked closely alongside Jonas during the course of the major Tate retrospective have commented, "Joan is always moving back and forth and remaking, rearranging, so there's this live culture that's inherent to how she thinks." In a social and political climate where global warming and immigration are hot topics, this work explores Jonas as a citizen of the world and her positive, thoughtful impact upon it.